Every month Don't Take Pictures releases an exclusive edition run of a photograph by an artist featured in the magazine. Each image is printed by the artist, signed, numbered, and priced below $200. We are pleased to release November's print, Untitled from the series The Superlative Light from Robert Shults. This limited edition comes with a signed copy of his monograph by the same name. Read more about Shults' work below. Purchase this print and book and from our print sale page. We live in a world of science fiction. In imagining technological marvels, radical recasts the work of this establishment as science fiction—thrilling and sinister, mysterious and fraught with urgency. Light itself is the subject of research in experimentation, or a distant, dystopian future, we often overlook present-day science, the stuff of which was once found only in novels and movies. Photographer Robert Shults conjures this science fiction, the kind that exists today, in a not-so-far-off place: a research facility deep beneath the University of Texas. Shults’ series, The Superlative Light, presents the viewer with a world that is, on the one hand, fiction-turned-reality, but on the other hand, ghostly and fantastical. Through stark compositions, high contrast, and harsh film grain, Shults this facility in Austin, Texas. It is home to the Texas Petawatt Laser, a device that has produced the brightest known light in the universe. Shults’ work both examines and embodies the idealization of technology that is integral to science fiction and so much of our modern, wired lives. 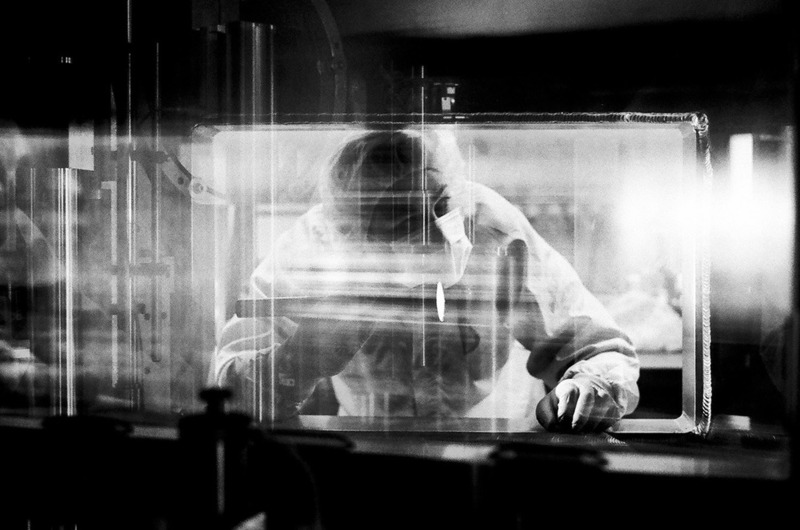 In one image, we see a man behind a glass panel, mouth and nose obscured by a facemask. With knitted brows, he appears concerned, his head awash in a strange, glowing light. He looks out and down, as if observing a dangerous experiment from behind the panel. The glass in front of him reflects the alien and synthetic environment that he inhabits. The viewer intuitively understands that these images are not of the real world, even if they represent something close to reality. Shults produces photographs that live in our own in time but reference the stuff of science fiction. Many of the images recall the still frames of Chris Marker’s La Jetée, a post-apocalyptic film depicting a future of time travel, questionable science experiments on non-consenting human subjects, and general dysphoria. 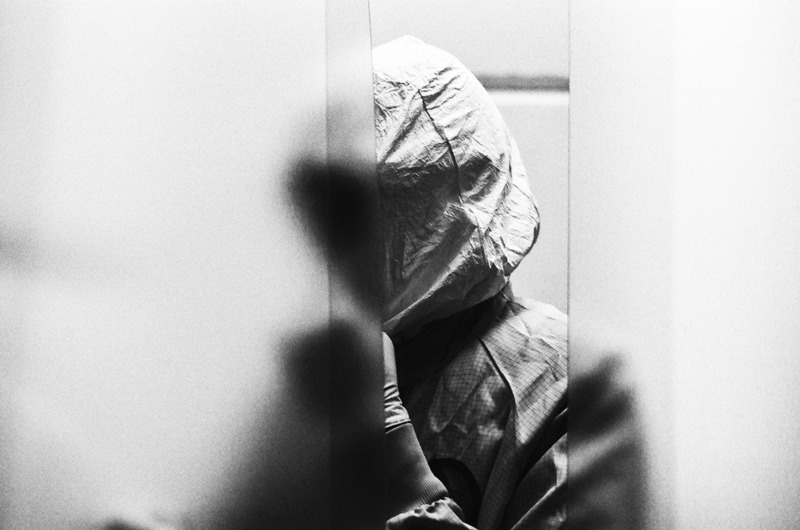 Like the images in La Jetée, Shults’ photographs capture an ominous rendition of technology, science, and the future. Selected from real life situations in a state-of-the-art research facility, these photographs are carefully crafted with a black and white film camera and the eye of the artist. These elements come together to turn the already unique setting into the photographer’s fiction. Because they are intended for an audience that is unfamiliar with laser research, the devices pictured seem foreign and incomprehensible, scrutinizing the relationship between man and technology. Without a background in science, Shults felt compelled to undertake this series by his irrepressible interest in science fiction. After a personal contact allowed him access to the laser facility, he studied the technology intensely for a year. The Texas Petawatt Laser is a complex device that is used by researchers to create types of matter unique to the centers of stars and planets. Researchers also perform advanced nuclear fusion, removing electrons from atoms in the same manner as the center of our sun. They are even able to create tiny stars and supernovae. It is this type of modern-day sorcery that appears in Shults’ stark photographs, where he has captured and translated that science reality into a compelling visual fiction. Shults’ photographs are often sparse, focusing on details but denying us an understanding of location and context. Harsh divisions between light and dark conjure mysteries, and we are convinced that some shocking truth is hidden in the shadows or just outside the frame. We see people at work, but they are often obscured by protective eyewear, suits, and masks. We get the sense that they are being secretive or engaging in classified activities. 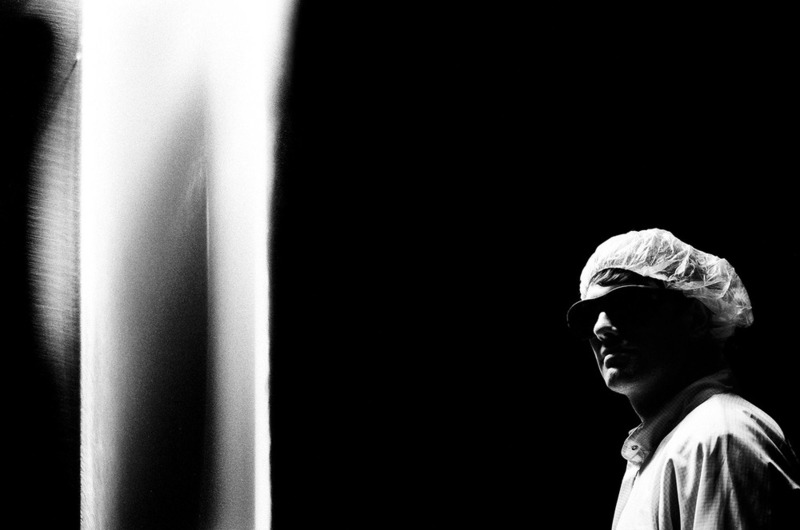 One photograph features a hooded, completely covered figure standing behind a translucent barrier that nearly bisects the frame. Anonymous and genderless, the figure’s face is hidden in shadow and blur, a deep black triangle. A translucent barrier bisects this void: A sheet of plastic or glass distorts the outer two thirds of the image. The figure’s raised hand suggests that it holds a monitor or other device for communication, and we perhaps imagine the figure reporting to some superior outside the frame. This sense of secrecy and hidden communication allows our imagination to fill in the dark empty spaces and construct our own narratives. Without accompanying language or context, the photographs convey a sense of the unknown. 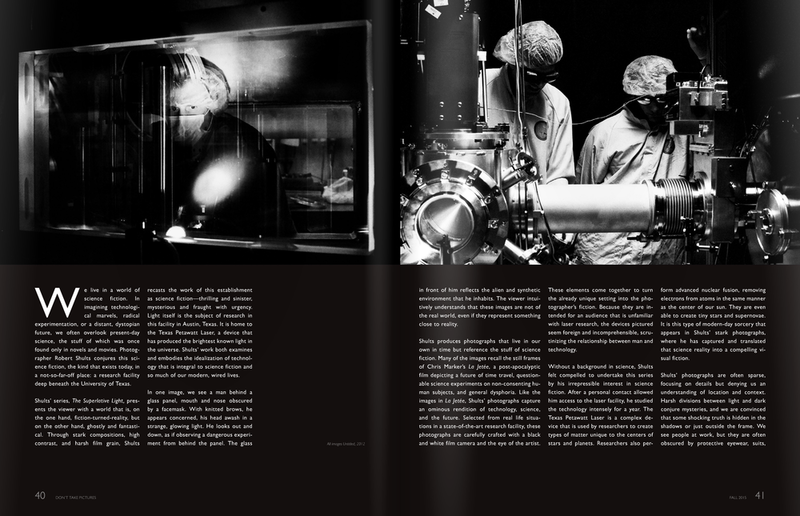 Had Shults chosen to include such text, these photographs could stand as documentation of the Petawatt facility. However, without this information, they allow for broader narratives, reminding the viewer of recurring ideas within science fiction rather than reality. This ambiguity allows the viewer to recall the trope of the immoral “mad scientist,” instilled in the collective consciousness by numerous popular science fiction books and films. The Superlative Light is a project in decontextualization, abstraction of reality, and construction of a new narrative using the familiar vernaculars of science fiction and cinematic presentation. Shults has thoroughly explored not only a facility, but also an entire genre, taking bits and pieces of reality, combining them, and through his own radical alchemy, created a new story. These images move beyond documents of reality to serve as spaces for the imagination. He leaves the viewer with room to contemplate what lies within the frame, but he fosters even greater desire to imagine what lies beyond. The series explores the idea of light and lasers, but leaves us enmeshed in darkness. Allison M. Walters is a visual artist based in New York.